Are you one of the over 50% of people in New York that are either in the overweight or obese category trying to lose pounds in NYC? Nationwide in the United States, about 36% of all Adults 20 or over are obese and another 33% are in the Overweight category according to the obesity data from Centers for Disease Control (CDC) – thus combined together, obesity and overweight status affect a staggering 69% of all adult Americans! Although most people might tend to think New York City is a lean city, the obesity data in NYC might be a bit skewed by the super thin people in the borough of Manhattan. Overall, the city of New York has it’s share of the obese – more than half of adult New Yorkers are overweight (34%) or obese (22%) according to data from the city of New York. The traditional thinking for the cause of weight gain is that it is the overeating and lack of activity on the part of the individual gaining weight as they thought weight gain is as simple as “calories in calories out”. So, the solution for obesity has always been over simplified as “eat less and exercise more”. However, if it is as simple as this, and everybody knows it, why is it that about 69% of the entire adult population dealing with being overweight or obese? The root cause of weight gain might be something entirely different. Studies have shown that up to about 71% percent of the population of the United States have some degree of insulin resistance and about 35% of all adults have prediabetes, also called metabolic syndrome. The end result of this process is type 2 diabetes over a 10-20 year time period. Studies have also shown that the incidence of type 2 diabetes has gone up by over 500% in the last 50 years or so and is expected to go up by another 500% in the next 20-30 years! Could insulin resistance explain the weight gain? As insulin is one of the most anabolic hormones known to man, and insulin resistance means that the body has to overproduce insulin in an effort to cope, this process of insulin resistance sets in a vicious cycle of overeating and weight gain. How can insulin resistance lead to overeating and weight gain NYC? Insulin levels control fat storage and once the insulin levels are high, the body is in fat storage mode. Now, if a person is insulin resistant, they are stuck in the storage mode even when they need to get the fat back, ie in between meals. However, the insulin blocks the release back of the fat leading to cravings for carbohydrates and overeating. So, the overeating seen in the obese may be a symptom of the problem, not the cause, according to Dr. Prab R. Tumpati, MD – a leading obesity medicine / weight loss physician and founder of W8MD medical weight loss centers of America. How can we reverse this vicious cycle? There is good news, however. Studies have shown that even a Small amount of weight loss can lead to significant health Benefits by reducing insulin resistance and reduce the need for many long term medications. W8MD weight loss center in NYC is a physician supervised medical weight loss and Wellness program aimed at addressing the complex metabolic, Nutritional, hormonal, stress, and sleep related factors under the careful supervision of a physician trained in the new Field of obesity medicine. Unlike the many cash only weight loss clinics, most W8MD Medical weight loss centers accept health insurance for the Visits so you can lose the weight safely and your insurance Might pay for the visits. Since sleep disorders and weight gain go together, most W8MD weight loss centers also address any underlying sleep problems including Sleep apnea, insomnia, rest less leg syndrome to name a few. 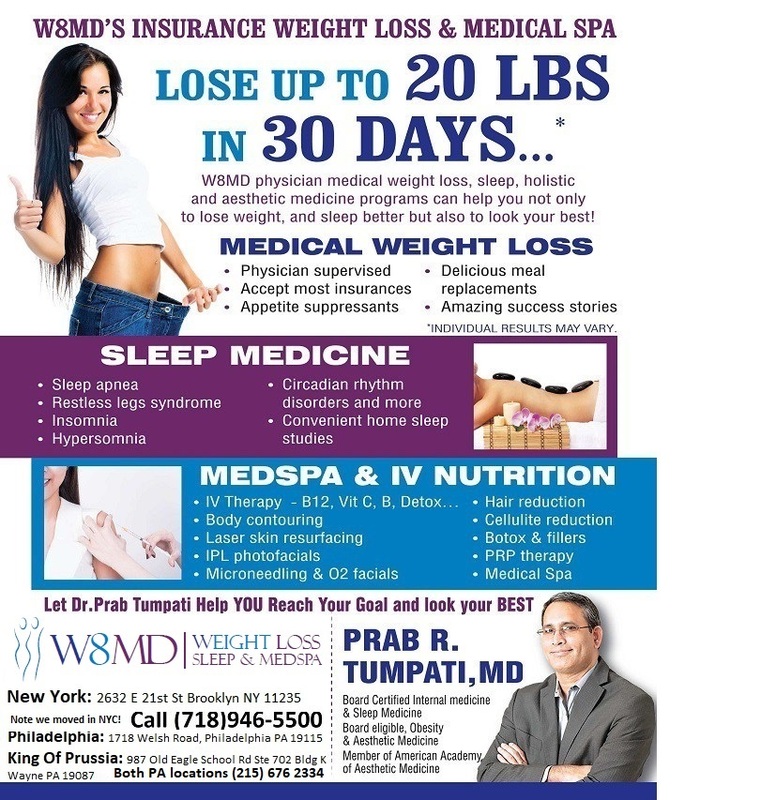 Our medical director, Prab R. Tumpati is one of the founders of W8MD and has passed a written board examination in the field Of obesity medicine in addition to being board certified in sleep Medicine and internal medicine. With no setup fees, no mandatory products, losing weight has never been easier. Cities Served: Brooklyn, Staten Island, Bronx, Queens, Bronx, Manhattan, NYC, Long Island, New York, Bayonne, Jersey City, Bensonhurst, Bath Beach, Coney Island, Dyker Heights, Rockaway Park, Howard Beach, New York City. Payments: Accept Most Health Insurances For Visits. We also accept American Express, Mastercard, Visa, Discover, Check, Cash for co-payments or weight loss protein supplements for very low calorie diets. Since this is a unique weight loss program that addresses the true causes of weight gain, and not an average weight loss clinic, we do get patients from far and near including from other states! or 1-800-986-3007 to learn more. Dr. Tumpati has been my weight management doctor for over a year, and has given me sustainable results with good dietary and health advice that allow me to adjust my lifestyle as opposed to going on some fad diet. Excellent doctor, very thorough, knowledgeable, and caring. I’ve been fighting obesity for years with little or no result, and now my waistline is melting, and I feel great! I highly recommend Dr. Tumpati to everyone who wants a chance to a new life. Extremely thorough, you will never feel rushed or neglected while talking with Dr. Tumpati. He takes the time to talk to you about everything. Wonderful doctor. Speaks to me with respect and great knowledge on weight loss. Fabulous results after 2 months, I’ve lost 30 pounds. Highly recommend. – Mike B.
NYC patients looking for help losing weight, please call 718-946-5500 to learn more. Due to popular demand, acceptance is limited in the insurance physician weight loss program in Brooklyn, NY.